Children’s eye health begins in the newborn nursery and should continue throughout childhood, says Michael Repka, MD, professor of ophthalmology and pediatrics at Johns Hopkins University School of Medicine. “For many children, an evaluation by a pediatrician may be enough. But if a child has a family history of vision or eye problems or has symptoms, he or she may need to have an official eye exam,” he says. Even if there are no risk factors or family history of eye problems, children need their vision checked at 6 months, 3 years, and before first grade. 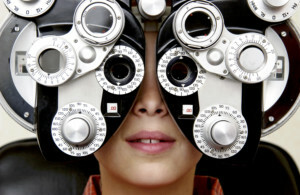 Most states require children to have an eye exam prior to beginning public school. Even if your pediatrician doesn’t see a problem, there may be other signs that your child needs a more thorough eye exam.